Pierre Hermé is the emperor of eclairs, the prince of pound cakes, the macaron maestro and now the chief of a new chocolate bar pop-up in Paris that will only be open until Easter (April 5). So colossal is Hermé's impact on the international pastry industry that the French government awarded him chevalier to the Ordre national de la Légion d'honneur and queuing outside his Rue Bonaparte shop is a gastrorite of passage. But the new chocolate bar at Le Royal Monceau Hotel, Raffles Paris makes for a more leisurely and elegant afternoon—an alternative to tea service. Here's how the experience goes down: Grand Cru tester “tablets” with varying degrees of intensity: (Manjari, Araguani, Caraibe) arrive at your table. After choosing your favorite chocolate (there is a praline option for non chocolate fans), the menu is tailored to your palate. Beverage comes first. Pick from the Originel, an Aztec inspired chocolate milk mélange of grains, pepper and a topping of corn foam, the herbaceous Comme au 16eme Siecle or the more classic Viennois, a killer hot chocolate topped with Chantilly cream. For boozers, the Whisky Chocolat cocktail is sultry, crafted with pure malt whiskey, cocoa liquor and whisky cream. Next up: Pastries. Pastries that are so whimsical, so exquisitely presented that it feels insidious to take a spoon to them. 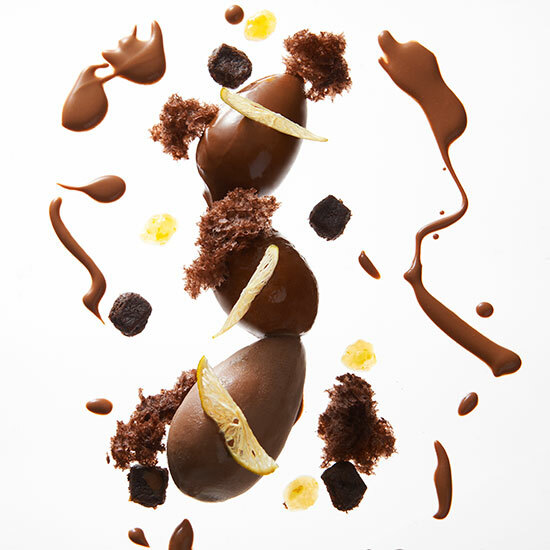 Take AZUR, creamy scoops of Grand Cru Manjari chocolate mousse accented with crunchy shortbread, candied yuzu kosho, slivers of dried lime and decorative swipes of tangy yuzu sauce. PLENITUDE is a hyper modern take on millefeuilles constructed of carmelized light-as-air puffed pastry filled with Grand Cru Araguani mascarpone, salted butter caramel bits and topped with a wave of chewy caramel. The final course displays Herme’s mix master artistry at full tilt. It's a trilogy of chocolate cream shooters with different flavorings: crunchy mint granita, smooth avocado and banana compote and crispy red fruits. The upside? High concept chocolate that will blow your mind. The downside? Storebought fare will no longer be acceptable. Le Royal Monceau, Raffles Paris ‘Bar Chocolat by Pierre Hermé Paris’, Available Through April 5, 3 – 6 p.m.